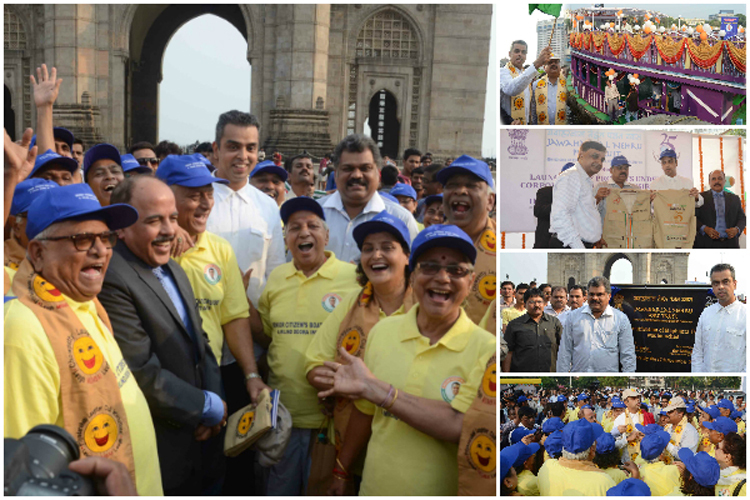 On 27th November 2013, Mr.Deora flagged off a Boat Cruise for senior citizens at the Gateway of India in Mumbai. The programme was launched by the Ministry of Shipping with a view to boost Mumbai’s coastal tourism. Free sea cruises for senior citizens, educational tours for school students to the Jawaharlal Nehru Port Trust (JNPT) premises, creation of facilities at Elephanta and a plan for Gateway were announced as part of the corporate social responsibility initiatives of the JNPT. JNPT under its Corporate Social Responsibility scheme had financed the event. The JNPT, in partnership with the Government of Maharashtra also plans to undertake numerous measures to adorn the Elephanta Caves and the Elephanta Island which are located 10 kilometres off the Mumbai Coast in the Arabian Sea. On 2nd December 2013, Mr. Deora participated in a live twitter chat directly answering questions posed to him by the citizens regarding the need for a directly elected mayor in Mumbai. These questions were submitted on twitter by several citizens on the @UthSpeak twitter handle. UthSpeak is an initiative begun by Mr. Deora to connect Indian youth and the decision makers of our nation. It is an apolitical platform where the youth can voice their opinions and make themselves heard on a particular topic every month. 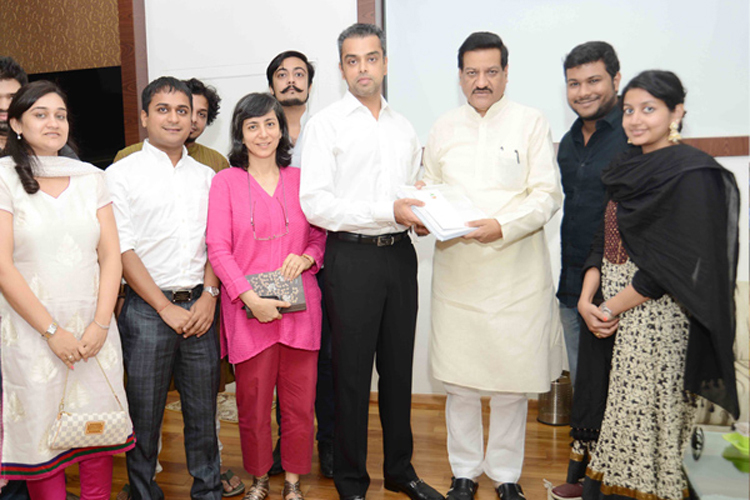 On 7th December 2013, Mr. Deora along with @UthSpeak team met the honorable Chief Minister of Maharashtra Shri Prithviraj Chavan in order to handover the DMDA (Direct Mayor Direct Accountability) petition which was signed by more than 5000 Mumbaikars.The initiative of DMDA is Mr. Deora’s brainchild. He strongly feels that Mumbai is too large and complex a city whose administration cannot and should not remain dependent on the Maharashtra State Government and its ministers since they aren’t directly elected by the citizens of Mumbai. He firmly espouses the tenet of Devolution of Power and therefore believes that Mumbai ought to be governed by Mumbaikars who understand the intricacies of the city.He has urged all Mumbaikars to rise to the ocassion and write to their elected representatives across the political spectrum to provide impetus and momentum to this initiative. Mr. Deora expressing his sentiments on the fifth anniversary of the 26/11 Mumbai terror attacks said that it was not a day for sermons, hollow sympathies or platitudes but a time to remember the valour shown by our countrymen and to renew our determination to stay united and strong. 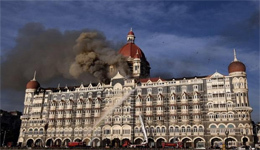 Five years ago, 10 LeT terrorists had launched coordinated attacks across key locations in the country’s financial capital Mumbai, killing 166 people, including policeman, NSG commandos and some foreigners. 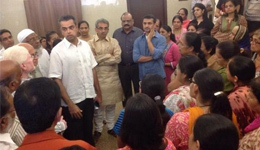 On 28th November 2013, Mr. Deora visited the Campa Cola compound to meet with the residents who face the predicament of demolition of their homes in May 2014 on the orders of the Hon’ble Supreme Court. Mr. Deora discussed the action plan for the future with the residents. He has been supporting the residents since the very beginning. On 1st December 2013, Mr.Deora attended the coconut breaking ceremony at Pimpleshwar Housing Society on Jagannath Road in South Mumbai. The building along with 60 others was constructed using funds granted by the Government of India. These funds were sanctioned by Late Shri Rajiv Gandhi, Former Prime Minister of India. 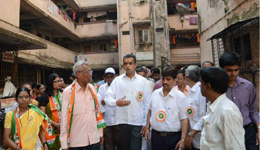 Mr.Deora also inaugurated the repair work of various other buildings. The Government of Maharashtra has allocated Rs. 125 Crores for the purpose of renovating the buildings. 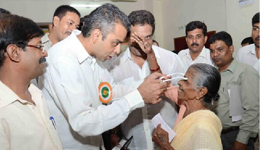 Mr. Deora on 1st December, 2013 organised a free eye check-up camp in Kalachowkie, Mumbai where 6452 spectacles were distributed and 279 cataract surgeries were scheduled for the underprivileged people. More than 80 such eye camps have been completed across the Mumbai with an average attendance of about 3000 people per camp where spectacles and medicines are distributed and cataract operations are undertaken free of cost. Mr. Deora on 21st November 2013 met RTI activist Mr. Shailesh Gandhi to discuss an action plan for a paper less Government. 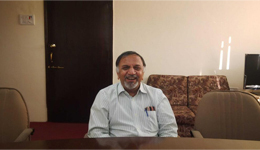 Mr. Gandhi was the former Information Commissioner with the Central Information Commission, New Delhi. Mr Deora has in the past also extended support to Mr. Gandhi for issues concerning citizens interest and public revenue like the Crawford market, Mill Lands and leased lands. 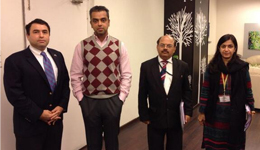 Mr.Deora met a host of dignitaries at his office in New Delhi on 3rd December 2013. He met Mr. Barry O’Farrell, Hon’ble Premier of New South Wales, Australia. Mr.Deora discussed the possible spheres of bilateral cooperation with Mr. O’Farrell. He also met the Hon’ble High Commissioner of Australia to India Mr. Patrick Suckling and certain other distinguished delegates which included Mr. Chris Eccles, Mr. Nihal Gupta, Dr. Peta Seaton and Ms. Anna Garretson. Mr. Deora on 3rd December 2013 along with officials from the Ministry of Shipping met Panama’s Ambassador Mr Julio de La Guardia in order to finalize a bilateral Maritime Cooperation Agreement between India and Panama. In the meeting both the parties discussed several important issues regarding cooperation between the two countries.